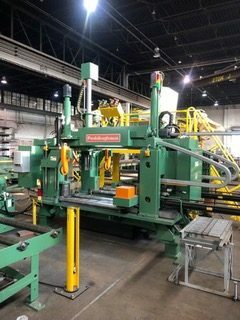 B&B Welding Company is proud to announce the arrival of its newest one-two punch, the Peddinghaus PCD 1100/3C high speed drill machine and the Meba DG-1250 miter saw. 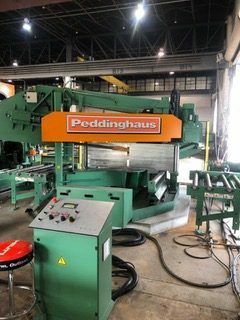 The Peddinghaus PCD 1100/3C is capable of processing structural sections as a W44x230 wide flange beam and as small as a 3/4” x 2” flat bar and almost eveything in between. From beams, tubes and chanels to angles and flatstock, there is almost nothing that the PCD 1100/3C can’t handle. It utilizes state-of-the-art Siemens controls and 25HP Siemens motors to power three drill spindles. Each drill spindle has a tool changer associated with it that is capable of holding five different tools. These tools can include carbide drills, taps, countersinks, mills and a scribing tool. The PCD 1100/3C is also equipped with an underside scriber to allow for piece marking and layout on all surfaces of a shape. The Meba DG-1250 Miter Saw is capable of performing straight cuts as well as miters up to plus or minus 60º off of 90º. It can handle sections as wide as 43” at 90º, 31” wide sections at plus or minus 45º and 21″ sections at plus or minus 30º. And being interconnected with the PCD 1100/3C, one operator is capable of running both machines with ease. 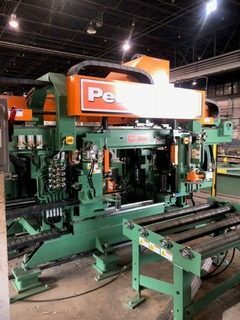 B&B Welding Company is excited to announce a fiery new addition to its fabrication team, the Peddinghaus ABCM 1250/3D Coping Machine. 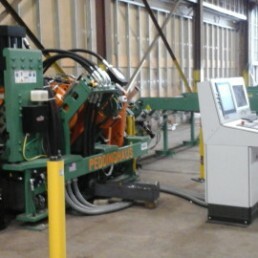 The Peddinghaus ABCM 1250/3D Coping Machine uses three oxy-acetylene torches on three axes to process structural shapes. From beams and channels to angles and tubes, the ABCM 1250/3D is capable of doing them all. The ABCM 1250/3D can handle sections up to 50” wide, 24” high flange and a maximum thickness of 6” (web and/or flange). Some of the ABCM 1250/3D’s capabilities include standard block outs and flange thins to weld preps, mechanical openings, tee splitting and even castellations and haunches. It can even cut material to length, if required. With the addition of the Peddinghaus ABCM 1250/3D, B&B Welding Company now has the ability to “cope” with most any structural burning need. September 30, 2016 we celebrated our 45th anniversary & Steel Day and unveiled our newest Peddinghaus Machine member, the AFPS 863HD Anglemaster. We now have the capability to punch 3 multiple size holes, part marks, and shear to length 8”x8”x1” thick angle for all you heavy duty needs. This is the first machine of its kind in the area. Give us a call with your inquiries and let us meet your needs. In addition to celebrating our 45th Anniversary we will be unveiling the latest in our family of Peddinghaus Equipment this SteelDay, 2016. AFPS the largest angle/flat CNC processing 863-HD, machines in the area will be commissioned and we will be capable of punching and shearing angle 8x8x1” thick. B&B Welding featured in a new Baltimore County video. Successful Baltimore County Businesses Little Crystal Bijoux and B&B Welding are profiled in this episode. Made in Baltimore County showcases entrepreneurs and shows you how you can use the resources of BCPL to start your own successful business. 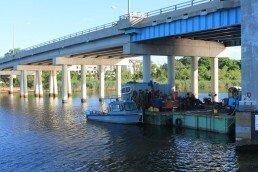 We now have a major role in the emergency repairs of the Peninsula Bridge across Bear Creek. 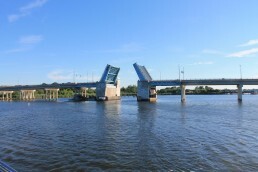 We partner with Covington Machine and SHA engineers to make the fix and get the bridge open again.